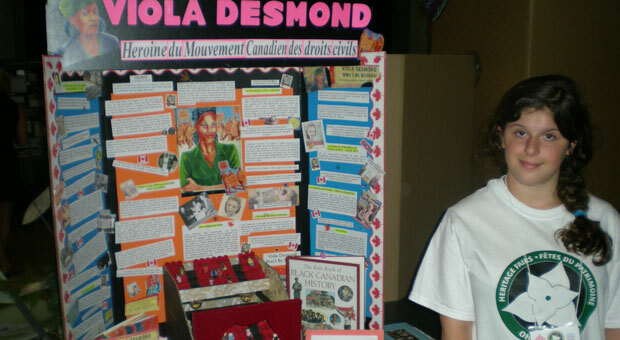 Viola Desmond was an African-Canadian woman who had great success travelling around Nova Scotia selling beauty products. On November 8, 1946, the car Viola was driving broke down in New Glasgow, Nova Scotia. While it was being repaired, Viola went to see a movie called Roseland. Viola was sold a ticket for the balcony section (where Black people could sit) but not knowing the racist policy of the theatre, she took a seat on the main floor (the section reserved for whites only). Viola was ordered to move to the balcony section. She refused and asked if she could buy a ticket for the main floor. Her request was denied and she was dragged out of the theatre and put into jail overnight. Viola showed great determination and courage in the defense of civil rights and those of black people in her fight to stop discrimination in Canada.